A few weeks ago I was making Jalapeno Popper Chicken for dinner but I was at a total loss of what to serve with it. I knew we would have a side salad but I felt like I still wanted something else. Suddenly corn casserole popped into my head and it seemed like the perfect fit. So I did a little searching but I was a disappointed with what I found. Pretty much every recipe called for a canned corn and Jiffy cornbread. I don’t love canned corn and I knew a box of Jiffy would be a difficult find in Suzhou (and probably expensive if I found it!). 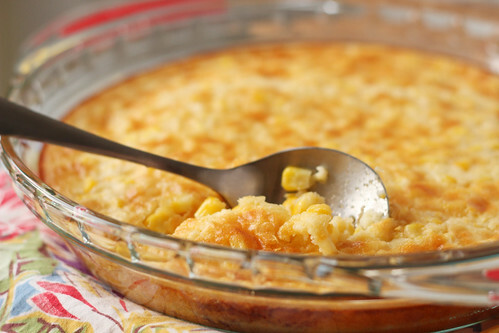 At that point I had my heart set on corn casserole, so I continued on the hunt for a from-scratch recipe. I never did find one that was everything I was looking for, but I did find one that looked like a good starting point. I made a few adjustments and cut the recipe in half so we wouldn’t have leftovers for a week. I’m really happy with how it turned and happy to have another side dish to add to the rotation. In a medium bowl whisk together the egg, sour cream, cream cheese, milk, butter, corn and any corn juices you were able to scrape from the cob. In a separate bowl, whisk together the flour, corn meal, sugar, baking powder, salt and pepper. Add the dry ingredients to the wet ingredients and stir to combine. Pour into a greased pie pan. Bake for 50-55 minutes or until it is set and the edges are golden brown. It’s OK if the center jiggles just a tiny bit. Allow to cool for 5 minutes then serve. 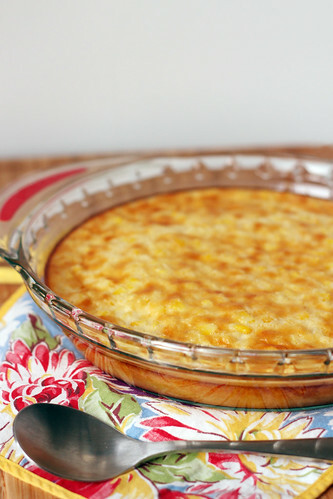 I love corn casserole, and any baked corn recipe. Yours is beautiful! Hey there, I wondered if the cream cheese ingredient was a typo since it wasn’t in the directions and it wasn’t in the recipe you adapted it from? Let me know, thanks. It was not a typo, I added cream cheese to make up for the heavy cream that I excluded in my version! It is whisked in with the other ingredients. Thanks for bringing that to my attention! Correction made! Thank you THANK YOU for this! I have been searching far and wide for a real food version of this dish and can’t tell you how many “from scratch” recipes included Jiffy mix and canned creamed corn. I’m kind of a purist and really appreciate this find. I have it printed out and ready to go. Cannot wait to try it! Instructions do not include what to do with the egg. Since I am in the middle of making this dish, I am going to add the egg to the wet mixture. You are correct, sorry for the confusion! The correction has been made to the recipe!